First Lines Second Thoughts is a look at the first lines of well known literary works. On second thought, do these opening words stand alone as poetry? Today, in honor of National Bourbon Heritage Month we look at literature's most famous spy. James Bond. What? You thought Bond only drank vodka martinis. Not in Ian Fleming's seventh Bond book — Goldfinger. Published in 1959. Under the working title of The Richest Man in the World Ian Fleming's seventh spy caper has British secret agent James Bond on the hunt for Auric Goldfinger. A malevolent sort who is intent on stealing the gold reserve from Fort Knox. As unlikely as it may seem, Goldfinger was named after a British architect Erno Goldfinger who upon hearing that the arch-villain was a caricature of him settled out of court with Fleming's publisher Jonathan Cape. The publisher agreed that all references to Goldfinger would be preceded by his given name of Auric. Fleming's solution to the imbroglio was to change the name of Goldfinger to Goldprick! Jonathan Cape won that particular battle. Fleming, who had a fondness for gin, switched to bourbon on the advice of his doctor. As the author switched to bourbon so did 007 who had a proclivity for doubles. While he is known for his "shaken, not stirred" martinis, when Bond is alone, his drink of choice is typically bourbon. Throughout the series Bond is known to have imbibed: I.W. 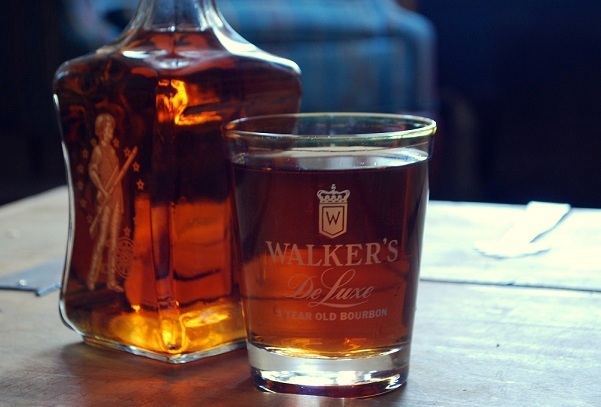 Harper’s; Walker’s DeLuxe; Old Grandad; Virginia Gentleman and; Jack Daniels (though technically not a bourbon). Bond drinks an Old Fashioned cocktail in the novels Diamonds Are Forever, Live and Let Die and Thunderball. In the novels On Her Majesty's Secret Service and You Only Live Twice Bond drinks Jack Daniel's. 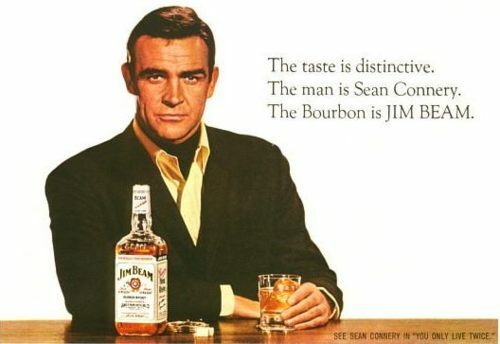 The connection between Bond and bourbon was quite strong in the 1960s as evidenced by this advertisement for Jim Beam.